Think the Dentist is Expensive? Then Brush and Floss! Do you have a lot of dental problems that seem really expensive to fix, whether it’s dental fillings, crowns, root canals, or dental implants? Do you feel like the dentist is just out for your money when you’re told you have cavities or gum disease, but nothing is hurting, so you think they’re just making it up? Do you write nasty comments (or even just agree with them) about greedy dentists on the news stories about them because you need a lot of work and can’t pay for it? If you’re one of these people, I have a tough love message for you: DON’T BLAME THE DENTIST – INSTEAD, TAKE A HARD LOOK IN THE MIRROR! Put another way: I’m sick and tired of being the “bad guy,” when all I’m trying to do is help you get better. It’s not my fault you have cavities or gum disease! Energy Drinks like Monster, Red Bull, etc. Sports drinks like Powerade, Gatorade, etc. Let me tell you a simple but maybe painful truth: if you don’t take care of your teeth, you have no one to blame but yourself. Seriously. Does your dentist make you drink 5 sodas per day? Or force you to eat all that candy? Or hand-feed you all that food with processed sugars? Has your hygienist ever taken the floss from your hand when you were trying to be good? Ummmmmmm…………………..yup, didn’t think so. What Are Your Priorities? Smartphone or Dental Cleaning? Oh yeah……I’m going there! You know how often there are stories in the news about lack of “access to care?” Let me offer a different perspective – the problem isn’t a lack of “access to care;” the problem is that people choose to spend their money on things besides dental care. Is dentistry REALLY that expensive, or are you just not budgeting for it? Yeah, I get it, I’m on a rant, and go ahead……challenge me! Tell me I’m wrong, and tell me why, and you know what? 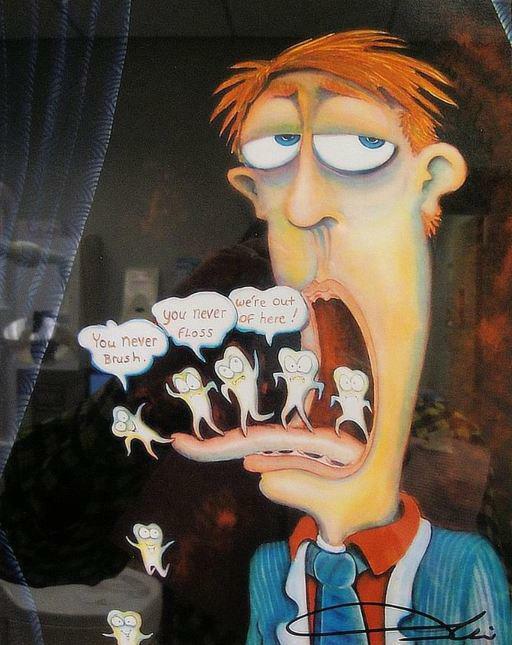 I’ll tell you all the reasons you have cavities, and guess what…..none of them are my fault! Here’s the thing…..I TOTALLY understand that…..YES……dentistry is actually expensive. You should see it from my side. Have you ever bought a laser that treats gum disease? Or a CAD/CAM system that lets you make a porcelain crown in 1 visit instead of 2? Or microscopes to see really well and keep you from debilitating back pain so you can keep helping people? Or attended 260 hours of advanced training in just 1 year to stay on the leading edge of your field? I bet if you did, you would have a whole different perspective, and honestly, you’d probably be GLAD that your dentist does things like that, just so s/he can take the best possible care of you. Or………..well, you have an alternative: go to the cheapo dentist and get what you pay for. OK……lemme have it – my flame suit is on! LOL Share this on Facebook, give it a +1 on Google+, or wherever you want to let people know – you can save money at the dentist by taking personal responsibility for your teeth by getting regular checkups and cleanings, brushing and flossing regularly, avoiding sugary foods and drinks!